Party Poker had a major press release on Wednesday when it announced that the mystery man who uses the online handle Isildur1 will pull up a chair for their televised cash game, The Big Game IV. The news comes on the heels of a blog entry by Party Poker spokesman Tony G where he literally pleaded with the anonymous Swede to take part in the game; going so far to assure his continued secrecy by not revealing his name and allowing him to wear any mask or disguise including Tony G’s own Kermit the Frog outfit. With online poker rooms in constant battle for exposure and publicity, Party Poker may have just scored a one-punch knockout: The news of Isildur1’s appearance could shoot Party Poker’s Big Game IV ahead of the World Series of Poker in terms of anticipation in the poker world. 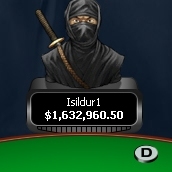 Isildur1 has fast became one of the biggest stars to come from the online poker scene, even over taking the links of Tom Dwan in popularity. This all by a man that people still assume is Viktor Blom, but noone can say 100%. This entry was posted on Wednesday, March 31st, 2010 at 8:26 pm and is filed under Poker News. You can follow any responses to this entry through the RSS 2.0 feed. You can leave a response, or trackback from your own site.